Do You Need a Dental Bridge to Move Forward? Suffering from tooth loss means that your life is changed — at least in the short term. Suddenly, you may no longer be able enjoy the foods that you used to eat. You may experience pain, both emotionally and physically. Further, you may feel uncomfortable with the appearance of your teeth. This will lead you to smile less, and ultimately feel less happy. If you don’t repair your tooth loss, these short-term problems can become long-term problems. Your remaining teeth may end up shifting to fill the gaps in your jawline. You can develop a crooked bite that wears down your teeth and causes soreness. You want to get over your tooth loss. Do you need a dental bridge to move you forward? A dental bridge is a prosthetic, fabricated by your dentist. I bridge is composed of two book-ending dental crowns, which are eventually placed atop the healthy teeth on either end of your missing teeth. 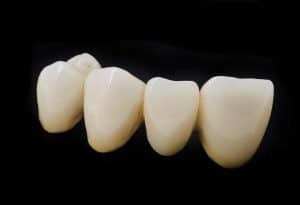 In between are the “pontics.” These are the replacement teeth that are made — typically from dental porcelain — to fit the teeth that you’re missing. If you’re missing several teeth in sequence, a dental bridge is a great prosthetic option to help you move forward. Another important quality of your dental bridge is that it’s made based on precise measurements of your mouth. Your dentist will not only measure the area and footprint that the missing teeth have left behind, but he or she will measure the surrounding teeth as well, so your dental bridge should fit comfortably alongside your healthy teeth. Plus, the bridge will be aesthetically crafted to match the appearance of your other teeth too. You don’t have to let the short-term effects of tooth loss turn into long-term effects. You can move forward from tooth loss with a dental bridge that replaces what’s missing. Greenhaven Family Dental is ready to create a custom bridge for you. The friendly staff understand that tooth loss can be traumatic, so they’re ready to help you through the process of recovery. To make an appointment for a consultation with Greenhaven Family Dental, contact the office in Baxter, MN at 218-454-0523.